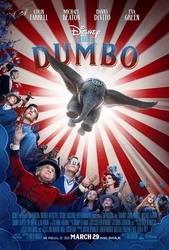 A live-action remake of the animated 1941 Disney film, “Dumbo”, in which a young elephant with extraordinarily large ears develops the skill to fly. Eva plays Colette Marchant, a French trapeze artist who works for Michael Keaton’s V.A. Vandemere. This film is Eva’s first Disney produced film project. This film is Eva’s third collaboration with Tim Burton after Dark Shadows (2012) and Miss Peregrine’s Home for Peculiar Children (2016). This film is Tim Burton’s second live-action remake of a Disney animated film, after Alice in Wonderland (2010). This film is Michael Keaton’s fourth collaboration with Tim Burton after Beetlejuice (1988), Batman (1989), and Batman Returns (1992). This film is Danny DeVito’s fourth collaboration with Tim Burton after Batman Returns (1992), Mars Attacks! (1996) and Big Fish (2003). In three of them, he has played a circus member. Tim Burton, Danny DeVito & Michael Keaton previously worked together on Batman Returns (1992). Filming started at the Cardington Hangers in Bedfordshire, England on the last week of May 2017. The film’s filming code name was Big Ears. Eva and co-star Lars Eidinger will also co-star in Eva’s next film Proxima. Due to the physicality of playing a trapeze artist, Eva was trained by celebrity fitness trainer David Kingsbury. Dumbo is Eva’s Disney movie debut. The film is the second live-action Disney film to feature a live-action baby elephant in a major role, after The Jungle Book (2016). Dumbo is the second Disney film to have a heroine named Collette, after Ratatouille (2007). The film will be released several months before the original Dumbo (1941) film’s 78th anniversary. The film’s story is based upon a story written by husband-wife team Helen Aberson and Harold Pearl, and is loosely inspired by Walt Disney’s 1941 animated film Dumbo.